In this series, professionals share their WOM (word-of-mouth) marketing secrets. Read the stories about contagious content, WOM and viral marketing here. How can we create content that will go viral? What is the recipe for digital WOM (dWOM) and viral marketing? This post explains the five critical steps you need to take to succeed with viral marketing. Lots of people will tell you what you should do when using social media or how to do word-of-mouth (WOM) marketing. This is not one of those posts. We focus on factors that affect your chances of your content going viral. Quick Scan – select one of the 7 points below and get the beef right away. As the author of the Harry Potter books, JK Rowling is a big star in the publishing business. In the past, publishers used the 80:20 principle; experience showed only one book of every five was a commercial success. According to Jonny Geller, joint chief executive of UK literary and talent agency Curtis Brown, things have changed drastically. These days it is more like 96 to 4 percent. So when JK Rowling published her first crime novel under the pseudonym of Galbraith, it turned out to be a flop. It sold barely 400 hard copies in a year. But when it became known who was behind the pseudonym, the book took off. Bottom line: The superstar reigns supreme in the publishing business as the Rowling case illustrates. However, the same applies in content marketing. If you are famous or have a well-known brand, it helps tremendously. No question, people want to be entertained. Streaming content using a mobile device is becoming increasingly popular. Thus, content explaining calculus or how to use a tool properly will probably not go viral. Unfortunately, making haul videos or telling others how to apply make-up is not everybody’s favourite activity either. Bottom line: Entertainment is fine. However, unless your target audience consumes such content (i.e. handymen needing tools), the cash register is unlikely to ring. Trendwatch: The first of this new genre of Terribly Tiny Talkies or TTT for short was, according to Tehalka, Devasish Makhija’s El’ayichi (Feb 2015). Great TTTs are five to twenty minutes and becoming increasingly popular with mobile users. Cuddly is a cute example of a low budget TTT filmed on location. The social share buttons on a blog entry are supposed to entice others into sharing content. Naturally, content that is funny and entertaining is shared more often than serious stuff. Usually people share things right after having scanned a title without reading a single sentence in the entry. People love free but relevant content. Without relevancy, they will not read beyond the title or view your video longer than eight seconds. Nevertheless, people are more likely to share something on social networks if many others have already shared it. The logic is, many ‘friends’ cannot be wrong. Curious? Join 1,500+ other subscribers to this blog’s newsletter and read on! 1. One’s newsfeed may be clogged with too many updates. 2. Pew reported in 2013 that 42 percent of Americans using Facebook leave the site for weeks at a time! Hence, there are plenty of updates they will never see. Being first out of the gate helps get media attention for your video, blog content or white paper. Gangnam Style took a while to go viral. First, some Korean newspapers picked it up. Only a while later were TV channels and newspapers elsewhere interested in the phenomenon. In 2012 Felix Baumgartner was the first skydiver to break the speed of sound. 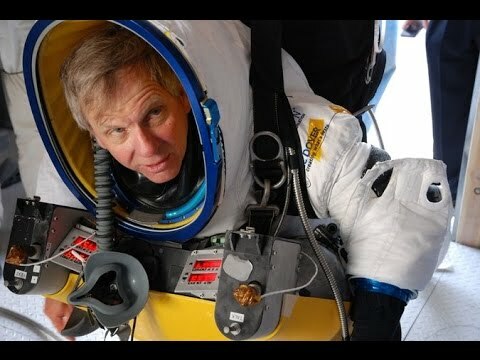 Alan Eustace beat Felix Baumgartner’s world altitude record for a parachute jump. He reached speeds beyond 1,300 kilometres. But far fewer people watched the event live (i.e. via streaming or TV) or on a video later. The second time around it was far less exciting for media to do a big spread about this record. Bottom line: Being first off the starting block is critical (see Baumgartner versus Eustace), because the second time around, people may no longer care much about the event or the message. The world got excited when Baumgartner jumped. Eustace’s record a few months later was pretty much ignored by media. Regardless what people tell you, luck certainly helps make things viral. For instance, Intel sponsored a study; its media people managed to get journalists to attend press conferences and write editorial content about the white paper that resulted from the study. Nevertheless, all press coverage failed to generate buzz or get people to share findings by word-of-mouth (WOM). The videos neither went viral nor did they create more than a quick blip on the social media radar (see below). Bottom line: The Intel case illustrates that even if print, radio and TV pick up your story, consumers may not bother. Creating buzz or having content go viral is great. But whether I reached my target audience remains a fair question. For a business, unless WOM or viral content results in an outcome such as higher sales, donations, buyers of our service, etc. it has limited commercial value for the organisation. Just increasing traffic or readers / viewers of your content will not help pay the rent for next month. 2. Entertainment: People want entertainment, but a haul video won’t necessarily get a lumberjack’s attention. 3. Herd mentality: Many Social Shares motivate others to share as well. 4. Being first off the blocks: Improves your chances for media coverage. 5. Luck always matters: We all need it and gladly take it if and when it shows up. Interesting read: More content about viral and word-of-mouth marketing. Below are the slides for this blog entry. Check them and the links in the presentation out for more information and examples. Now that you have read “How to make your content go viral and its checklist“, I would like to ask you a question or two. – Do you have a great example of viral, buzz or word-of-mouth marketing? Please share! – How should a SME (i.e. small- or medium-enterprise – a company with fewer than 250 full-time staff) go about getting its content to go viral? That is a very interesting trend. I wonder how this will make it tougher for Twitter and Facebook …. to sell advertising on user videos. But maybe all these usage numbers will continue to go up? That paled in comparison to the $129mio in expenses Snapchat incurred in the first 11 months in 2014. 4. Advertisers love Snapchat’s 100mio users of which 45% are between 18 to 24 years old. Very interesting link. Thanks again. – 4bn daily video views Facebook reported in April 2015. Following those tips provided by this article of yours will really bring up something good and useful. Internet marketing is connected to social media as is blogging. The article provides good insights about what needs to be done to accomplish viral marketing – besides a bit of luck. Here is an article that will educate you on how to have more social media followers: http://www.siteabove.com/how-to-get-more-social-media-followers/. I am not sure if followers on Twitter or readers of your corporate blog is a great proxy for how much you influence people. I would, for instance, prefer looking at engagement. The latter can be measured on how much dialogue you have in your blog or what percentage of your Twitter Followers clicks on the URLs you include in your Tweets. Of course, getting more readers or followers also requires that you post new content regularly. Twitter accounts that have no new content for months may not influence many people very much. Will they? Maybe same applies for blogs or websites? At least this is what our tool DrKPI.com suggests from benchmarking thousands of blogs. I appreciate your suggestions made in your blog post very much. In addition, we probably need to test some of your suggestions and ideas to see if they result in the outcomes you predict. I love to see numbers on these issues. Do you have any numbers on this issue? Thanks so much for sharing Amara.